Welcome to the happiest little home in New Orleans! I am so over the moon excited to finally start sharing this project that I have been quietly working on for months. Before I dive into all the master bedroom details, here is a little bit of a backstory on this amazing house: It’s a typical New Orleans shotgun house (narrow rectangular house, with rooms arranged one behind the other and doors at each end of the house), with 2 separate sides that was built in 1914. The house had previously been renovated (possibly in the 80’s or 90’s) with vinyl flooring, lots of beige and builder-grade finishes and my clients ripped it all out and restored it to its original glory! They vaulted the ceilings (13 ft! ), added those amazing 200 year old reclaimed Cypress beams and restored all of the original heart pine floors. They also made some changes to the footprint of the house, uncovered hidden original chimneys and added long rectangular windows that literally flood the rooms with natural light. This house is basically the definition of goals! My part came in with most of the design and styling decisions. My clients (who are the best) basically gave me full reign to add a dose of happy style to the house and I did that with wall treatments, lots of art, color and plenty of texture. We also worked together to choose bathroom finishes, tile, rugs and some of the furniture. Seeing it all come together in person was so rewarding and with that said, lets dive into my favorite room in the house: the master bedroom. We all love a good before/after and this is GOOD. Like I mentioned, the house was an 80’s beige canvas before. During the renovation, they took out the back door, removed the vinyl flooring, took out all the closets and old window and replaced with 2 new taller windows and 2 rectangular windows on the back wall. They also added an adjoining bathroom, replaced all the standard door and door frames with 8’ doors, painted (the whole house is painted BM Chantilly Lace) and added those amazing Cypress beams. The wall behind the bed was tricky because of the size and the windows. The room already had so much happy character, but it still needed a burst of color and life. 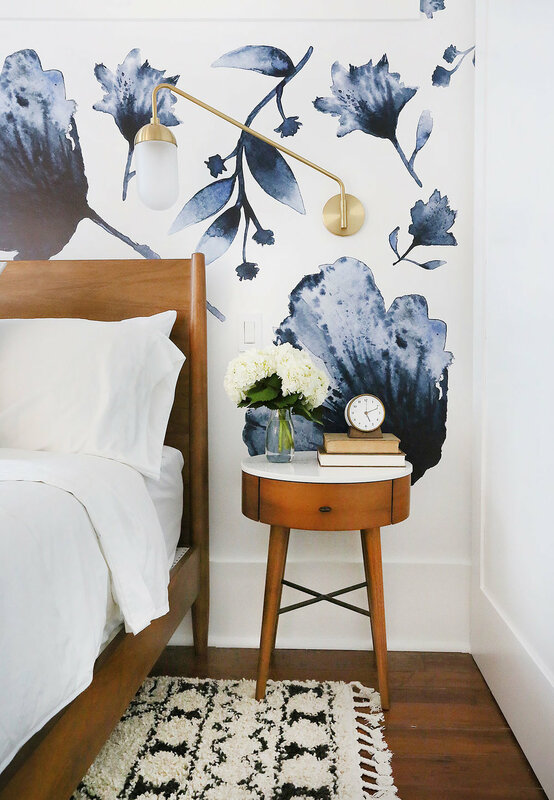 Enter these amazing inky floral decals from Urban Walls! I love these so much that I want to use them in my home (that always happens!) As soon as we started to install them, I immediately knew it was the best decision ever! The walls and trim are painted BM Chantilly Lace (one of my favorite whites) and we kept most of the other decor pieces pretty simple so the florals could be the star of the show! I love the warmth from the wood tones in the bed and nightstand paired with the texture of that rug (which is awesome and so affordable). I’m so happy with the way it turned out and my clients were too (which is so awesome). They were a bit nervous about using decals but I assured them that these would be amazing and they delivered on that promise! What do you guys think? Let me know in the comments! And stay tuned to my blog through out the next couple of weeks as I share more rooms from this amazing home!